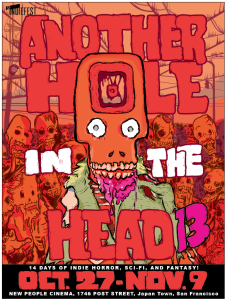 The (Lucky) 13th Another Hole in the Head will be held October 27th – November 9th at New People Cinema in San Francisco. The schedule is online now. Another Hole in the Head (aka “HoleHead”) is a film festival celebrating Horror, Sci-Fi, Fantasy, and a broad spectrum of related cinema from across the globe taking place at New People Cinema in Japantown (1746 Post St, San Francisco). Defying convention, we bring a daring audience the most intriguing genre fare from both emerging and established filmmakers. Whether you’re looking for outrageous Exploitation, dark & offbeat Comedy, awe-inspiring Sci-Fi, or mind-bending Experimental Art, this is two weeks of phenomenal film you won’t find in your local cineplex! AND THATS JUST THE FIRST WEEKEND WITH MORE TO COME!! Passes for Another Hole in the Head are on sale now! Our All-Festival pass gets you into every one of our 47 shows, and is a steal at $149! Our 10-show pass is $85—that’s 57% off our General ticket price! Our 5-show pass is $50—33% off!Passes are non-transferrable. Please arrive at least 15 minutes before show time to guarantee seating.